We’ve been watching the Water Company Block closely as September 6 approached and passed. 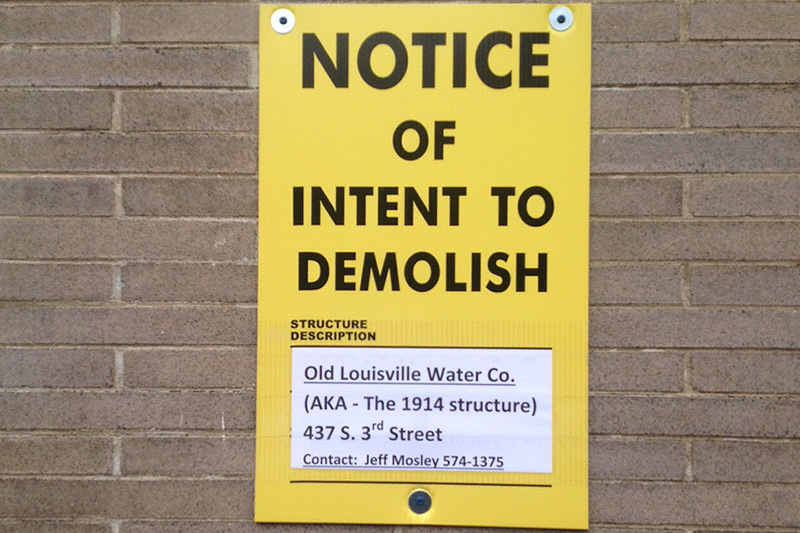 That day ended the 30-day stay of demolition on the old Louisville Water Company Headquarters on Third Street to make way for the planned Omni Hotel & Residences. 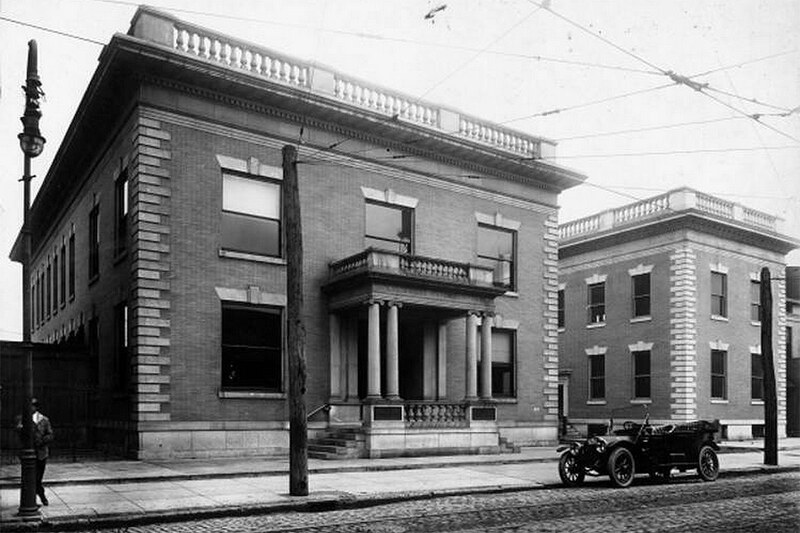 According to wrecking permits files in August, Metro Louisville would be able to raze the 1910 building and its 1914 annex any time after that date. But September 6 came and went and the buildings still stand. That’s because of a last-minute petition filed by nonprofit Neighborhood Planning & Preservation (NPP) on September 4 to declare the 1910 structure an Individual Landmark. That move kicked the demolition can down the road until at least October 15 when the Landmarks Commission will take up the case at a public meeting. In 1854, after Louisville lost considerable property in multiple fires, the Kentucky Legislature established the Louisville Water Co. by charter. Within decades, Louisville’s treatment advancements transformed the quality of water from disease facilitating to some of the cleanest and tastiest water in the country. Thus, the Louisville Water Company became a pioneer and national model in transforming an imperfect community resource (Ohio River water) into an asset for public health and safety. For this historic contribution alone, from its very grand pumping sites on River Road to the more modest Crescent Hill reservoir, all Water Company structures merit recognition and protection. These Colonial Revival structures, utilized by the Louisville Police Department for a time after 1998, represent a bygone era where downtown served every local need, including department stores, specialty shops, eateries and hotels of grand distinction. Located amidst it all, The Water Company on 3rd Street, afforded the Louisville consumer an opportunity to fulfill a most essential errand–pay their water bill– on the way to and from the early 20th century form of shopping convenience: a downtown that met the full range of public needs. Two large brick buildings behind the headquarters dating to 1915 have already been razed. Demolition was allowed to proceed because they were classified as non-contributing in a third-party study of Downtown Louisville’s built fabric. Earlier this year, two other historic buildings were directly to the north were razed under an emergency demolition order. A special preliminary meeting of the Committee on Local Landmarks & Preservation Districts took place on Monday, September 14 where the petition and a staff report were reviewed. A future public meeting was also set for Thursday, October 15. That meeting takes place at 8:30a.m. at the Old Jail Building, 514 West Liberty Street. A report issued by the Louisville Metro Historic Landmarks & Preservation Districts Commission elaborates on the site’s history. It found that the buildings meets three of nine requirements for Landmarks status. Sources told Broken Sidewalk the report represents a “neutral” stance on preserving the structures. If the structures are given Landmark status, they receive additional protections meant to guard against demolition unless certain criteria such as economic hardship are met. It’s not clear what that might mean for these structures. The complex of structures was in use by the Water Company until 1998 and later housed a precinct of the Louisville Metro Police Department. They were eventually purchased by the city to make way for a planned multi-million dollar City Center entertainment complex by 4th Street Live! developer the Cordish Companies. That project languished and ultimately failed, holding up further development of the block or restoration of its historic buildings in the process. A drive to Landmark four buildings on the block, including the Water Company structures, by OPEN Louisville, another preservation advocacy nonprofit group, in the summer of 2009 was dropped, apparently to work with Cordish and Metro Louisville on incorporating the buildings into the City Center project. While the current Landmarks push may be too late to save the buildings, this earlier attempt might have changed the outcome on the Water Company Block. According to a tipster, asbestos abatement that already took place in the structures may have damaged the ornate mahogany interiors and mosaic floors beyond repair, making it much more difficult to achieve historic tax credits to fund a renovation or a potential move to another site. The city rejected several proposals from the community to move all or a portion of the structure to other sites identified at a community design charrette earlier this summer. Metro Louisville still plans to dismantle a portion of the 1910 building’s facade and put it in storage for later use. As we reported last week, numerous facades have been placed in storage since the 1970s with few ever resurfacing. Responding to community pressure about those facades, Metro Louisville Historic Preservation Officer Cynthia Johnson is convening a community workshop to figure out what to do with building parts in storage. The city has also said it would issue a separate request for proposals (RFP) for reusing components of the Water Company buildings. Its time to move on. Dismantle, store, and find a use later. if this property was so importatnt it should have been registered and put to use a long time ago. Jim you are right. As soon as a new project is underway, these nut cases want to talk about preserving this old falling apart building. Where were these nut jobs five years ago?? These nut jobs are lame. They need to get real and do what’s best for our city, and let omni bring jobs and economic success to Louisville!!! I wouldn’t go as far as calling people nutjobs. There is a need for vigilence. It payed off for Whiskey Row. But in this case it is too late. Two buildings have already come down, and the Omni and Convention Center projects represent almost a half billion dollars. I would love to have seen the building put to use. But you have to know when to hold them, and know when to fold them. Empty old buildings don’t pay the bills. I’m sitting here in my office in the 5/3rd bank tower, watching it rain into the building today. The place is already more than half demolished.. This lawsuit is a waste of time. There is nothing left inside that building to preserve. It is interesting to see the comments about this issue. Normally feedback on this site focuses on preservation and other “Green” initiatives yet on this case there is agreement that the building needs to go! The other issue, of course, is that Metro owned this property for years and, through willful neglect, basically condemned the buildings in advance. Remember when the arena couldn’t go on this block because there was general agreement in the community that we couldn’t tear down the Water Co block? Remember when Cordish was involved and it was generally assumed that these structures would remain and be integrated? Meanwhile, the buildings were left to decay and no protections were put in place. Surprise! When it was time for Omni and their plans, these buildings were no longer considered viable. 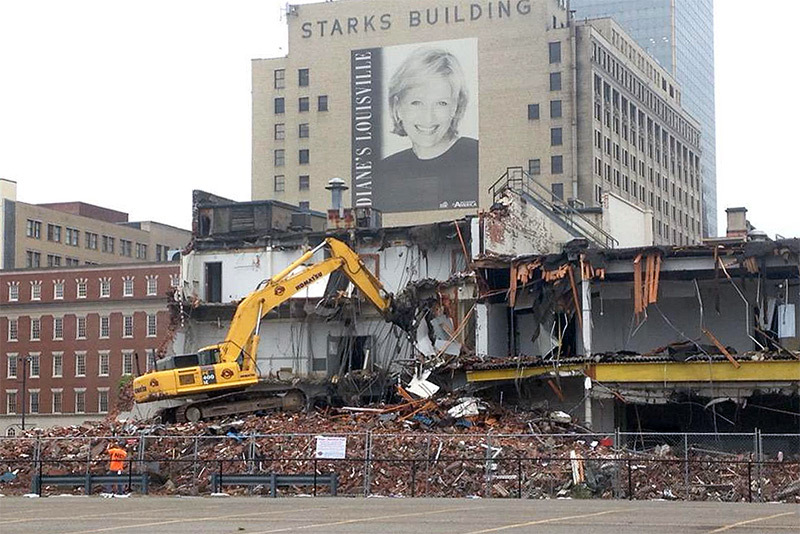 At least by Metro: The structural reports used to rationalize the teardowns of the Morrissey Garage and the Falls City buildings didn’t say what Metro said they did. Those of us who have wanted these structures preserved and used have nearly given up in the face of a weakened Landmarks Commission, non-enforcement of regs, and deals made without public involvement. To bad Restoration Hardware couldn’t step in and save these buildings. The Gallery’s they have been opening across the country saving buildings of similiar age have been doing very well. Seems to me someone should contact them and find out if they have an interest in even coming to our little city.